I first published this post a couple of days ago with some woefully unfocused photos. I took a new batch of photos this morning (thanks to a patient Bucksnort) and am trying once again. I suppose you might call our family irreverent. We laugh at everything, appropriately or inappropriately. 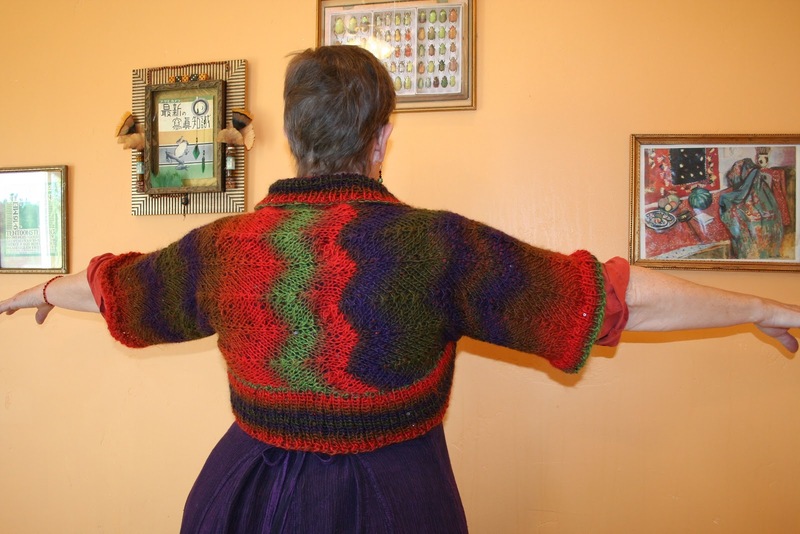 When Uncle Buck mistakenly referred to the new shrug I knit for my sister as a shroud, we loved it, and that's what we'll be calling it from now on. For a shroud, it's got some mighty bright colors, and sequins, too. This is the second in a series of three shrouds/shrugs that I am making for Auntie Bucksnort. You can see the first one here. 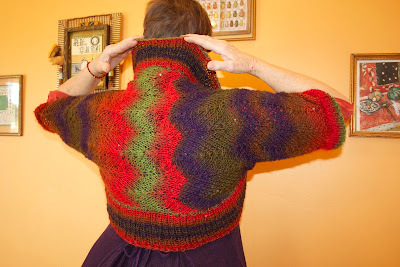 I keep fooling around with the basic pattern (Dream Shrug) and used a chevron lace stitch for this version, which is made from the brilliantly-hued Yarn Bee Diva Sequin Yarn in the Denali color way. Look closely and,you can see the sequins that appear randomly. A shroud with sequins? We should all be so lucky. 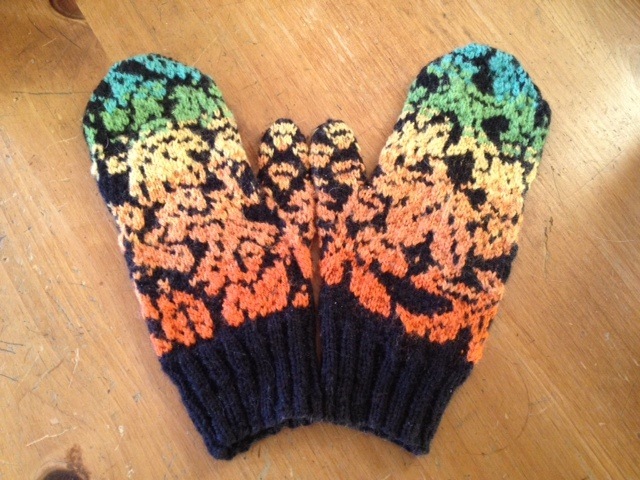 We have just emerged from a rare week of really cold weather which reminded me that I never showed you these mittens that I made quite a while back. The yarn and pattern came from Knit Picks, a fine online company that supplies some very nice yarns in seemingly unlimited color ranges. 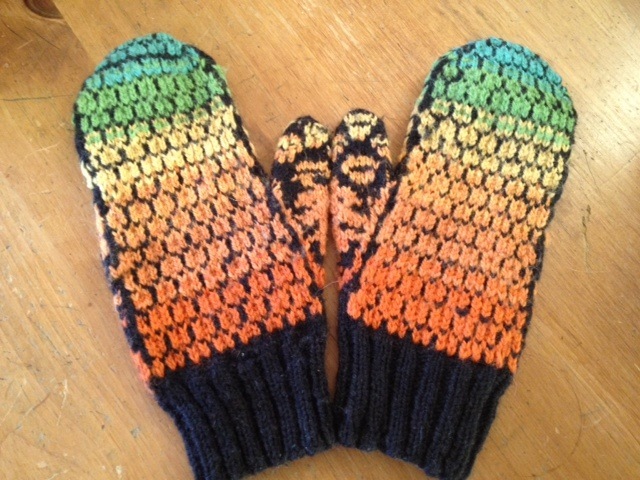 These mittens are part of a kit* (a gift from that nice Beez) that provides enough yarn for SIX pairs of mittens, each representing a different cold weather month. Well, six months of cold weather somewhere - not here in the Chihuahuan Desert. The yarn supplied with the kit is Palette, which is 100% Peruvian wool. 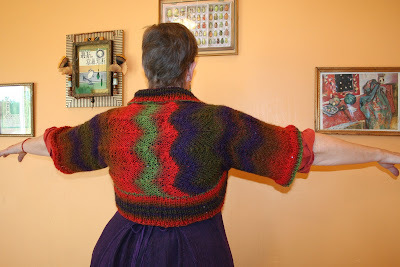 Take a look at all the colors it comes in by searching "Palette yarn" on the Knit Picks website. I plan to (eventually) make the other five pairs of mittens in my kit. The design in the one pair I have completed ("November") is pretty abstract to me, but if I scrunch up my eyes and stand way back I can make out some falling leaves. The back side is a nice design, too, although I messed up in a couple of places. The next pair I am working on has deer and mountains, and some lovely lavender and blue and white shades. Perhaps they'll be ready for mitten weather when it comes again next year. *As far as I can tell, this particular mitten kit is no longer offered. 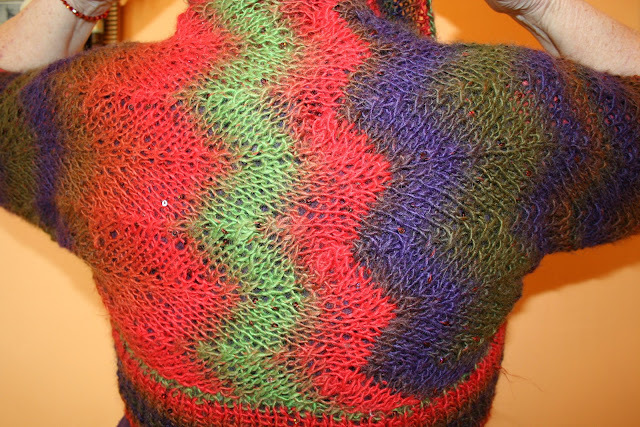 I've always admired knitted cables, although because they look so complex I figured that they would be really hard to do. Since cables were first on my list of knitting skills to learn this year, I chose a pattern that looked pretty straightforward and didn't involve a lot of yarn. It's called the Sulka Scarfette, and you can download the pdf file for free here from Babetta's Yarn Cafe, where it appeared on the last page of a 2009 newsletter. Once I got going, I was thrilled to see an actual cable emerging from my needles. So thrilled, in fact, that I didn't notice that little mistake (some purl stitches where some knit stitches were supposed to appear, up at the top of the first photo) until after I snapped the picture. 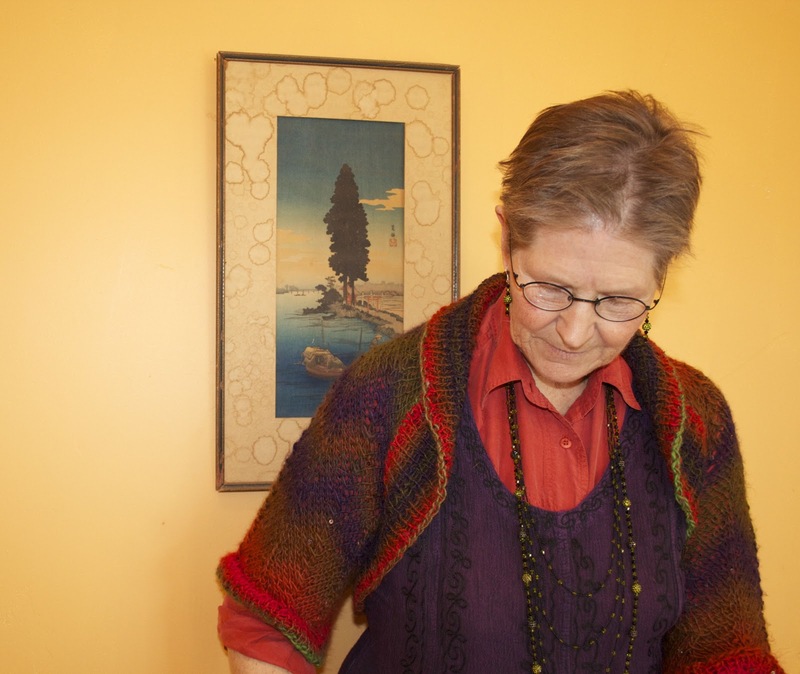 To make a cable, I found out, you simply slip some stitches off the knitting needle and onto a cable needle. Then, in this case, the cable needle with those stitches is held in the front of your work while you knit some of the next stitches that are still on the needle. 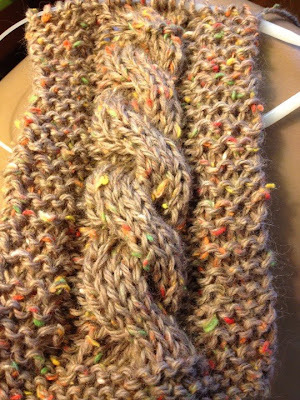 Then you knit the stitches you have been holding on the cable needle, and continue knitting the rest of the row. That's it! You put that little cable needle down where the cat can't get it, and you won't need it in this pattern for another seven rows. Now, I've only made this one kind of very simple cable, but I felt very successful about it. The completed scarfette makes a very cosy addition on a chilly day. You can wear it over a sweater or under a jacket for some extra warmth. 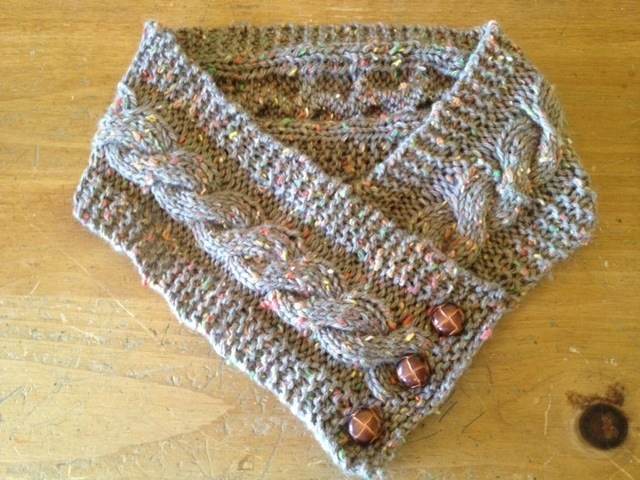 I used size 10 needles and some yarn given to me called Scheepjes Luzern Tweed, a wool/acrylic/viscose blend made in Holland. I'm not even sure that it is still being made, as a quick search showed that it mostly appears in "stuff from my mother's stash" type of ads on eBay. 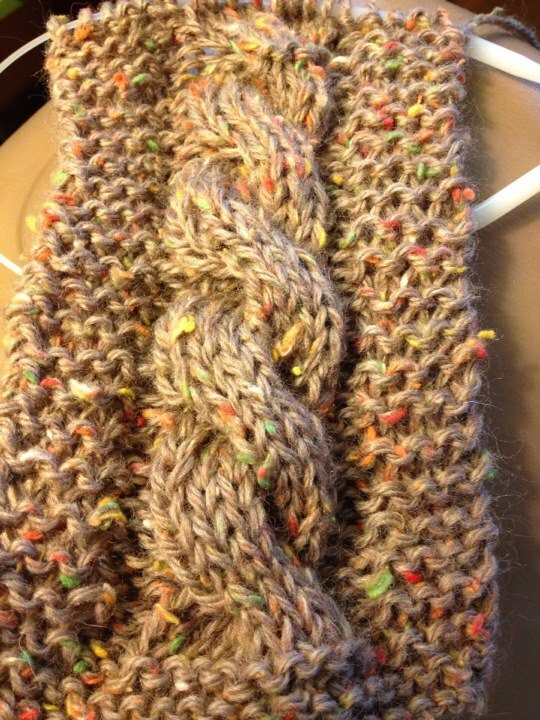 The project took less than a 50 gram/90 meter skein. I've just ordered some lovely merino/alpaca/donegal tweed yarn called City Tweed Aran from Knit Picks so that I can make a couple more of these simple little scarfettes. I'll let you know how those turn out. 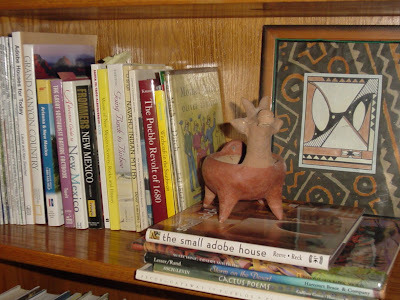 This page is really for me to keep track of the books I've been reading, but you are welcome to check back here from time to time to see the latest additions. I can tell you that, because of lists like this and because my Shelfari page helps me keep track, I read 92 books in 2010, 112 in 2011, and 141 in 2012. At the end of 2012, my always-growing list of books to be read still numbered somewhere around 753, so I won't be running out of things to read any time soon! Fleming: The Organized Family Historian; How to file, manage, and protect your genealogical research and heirlooms.